Microsoft has just beefed up its free web-based email Hotmail security with new features that make it easier to report hacked email accounts. 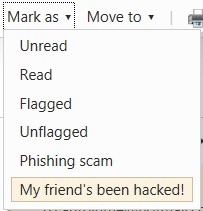 The next time you receive an email from a friend but realised it in fact is not sent from him after opening it, you can flag this to Microsoft by clicking on the “My friend’s been hacked!” on the “Mark as” menu. 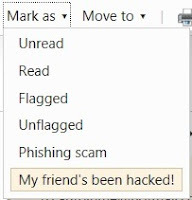 Apart from the "My friend's been hacked" security feature, Microsoft has also made it harder for users to set easily hackable passwords to begin with. Common passwords like "password" and "123456" are no longer permitted. According to Microsoft, this new feature will be rolling out soon. If you're already using a common password, you may, at some point in the future, be asked to change it to a stronger password.